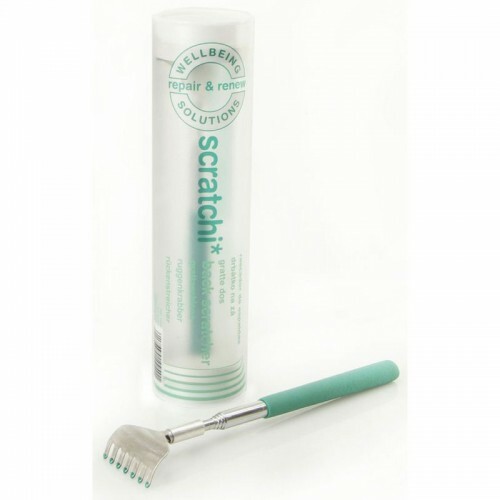 What every man wants and some women need... SCRATCHI the dependable, extendable back scratcher...! The ultimate weapon in the fight against the anytime itch... with it's massive 65cm reach and rake like fingers, this sturdy telescopic back scratcher is the perfect tool, capable of attacking all those impossible to reach nooks and crannies and deliver the best in itch control! SCRATCHI is ideal for all ages..with its aqua coloured non slip eva handle and co-ordinating rake tips, packaged inside a frosted PP tube, SCRATCHI makes the coolest of gifts.